NIYANTRA 2015 – The Annual Graphical System Design Contest !! NEW DELHI: India today asked China to invest in setting up manufacturing units in the country to bridge the widening trade deficit and create jobs in the country. 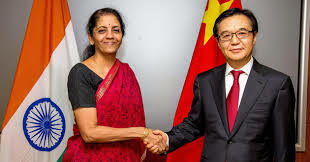 Commerce and Industry Minister Nirmala Sitharaman said India has signed an agreement with China in June to set up Chinese Industrial Parks in India.